style is style: You Can't Stop The Beat. Happy Friday! I hope you had a lovely Valentine's Day. I spent my evening with a lovely pink lemonade cocktail, nachos and Hairspray (which is, perhaps, my favorite movie). Zac Efron and delicious salsa, I can't really complain. It's funny how some of the most random thrifted finds end up living in your wardrobe for years... 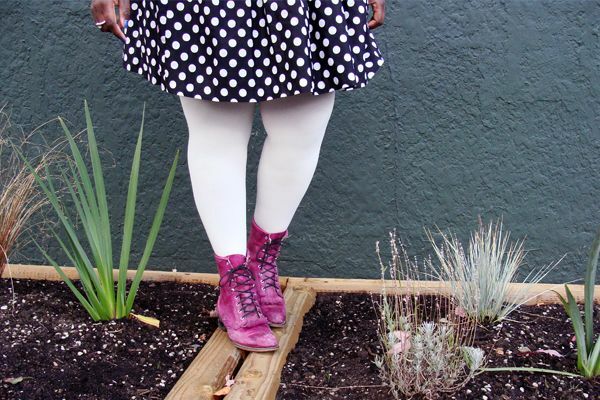 I bought these leather purple roper boots for $8 back in 2008 (<--- a hilariously old post). I hadn't seen the style before, and looked like the weirdest/coolest shoes. In fact, I actually left them at the thrift store, and drove back after class to get them because I couldn't get them out of my mind. Good thing they were still there! They've become my go-to "I need practical footwear but I still wanna be cute" pair of boots, not to mention they have garnered many compliments over the years (even a mention on Rookie Mag!). I'm fairly certain the cost per wear is at mere cents now. ps. I can't stop listening to Natalie Joos' Songza playlist. Friday bliss. You are so cute!!! I love the bright colors. What awesome finds!! Ahhh, I love everything about this outfit! 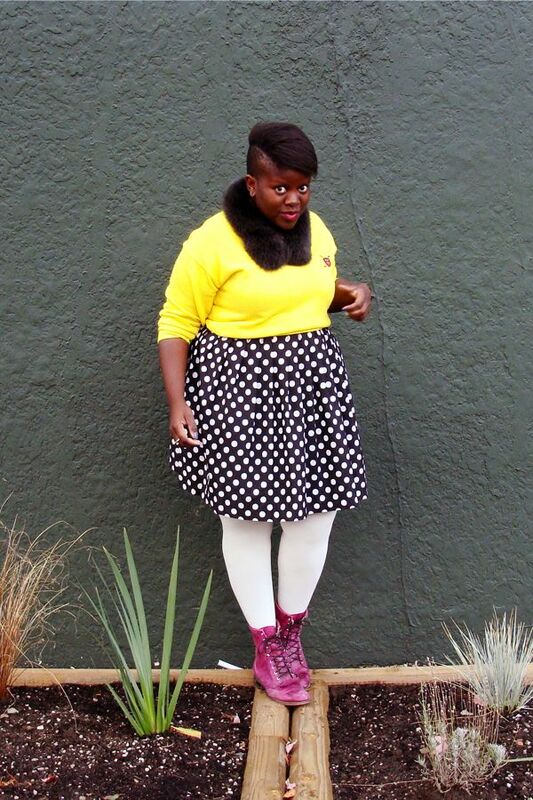 The boots truly are magnificent, the skirt is adorable, and I adore the fur collar! I totally agree about Hairspray, too, btw. Definition of a "feel good" movie. Plus, Zac Efron's ridiculous face. Loooove. Gorgeously cute as usual. You're such maverick with your color combos! These boots really are awesome. I love when a thrift find becomes a staple. They're such a pretty color and I love how they contrast with your yellow sweater. 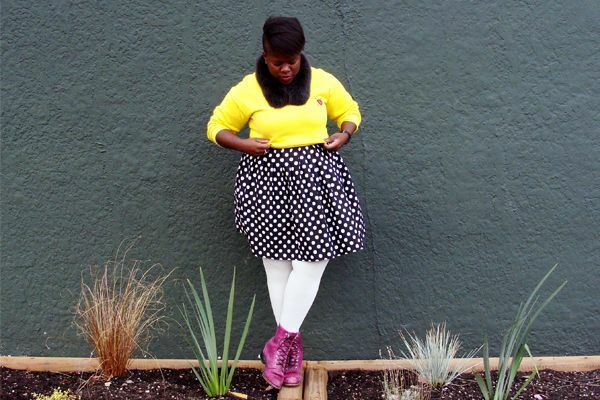 Your polka dot skirt is super adorable too! Those boots are amazing! How awesome that you have had them for so long! Love those pieces; also, that skirt is sort of perfect! Hairspray is one of my favorites too; Zac Efrom - swoon. :) Hope that your Valentine's was great! Love this outfit, the boots are AMAZIN'! You are adorable! Love the polkas, and I'm glad you didn't get rid of those boots! Know That I Adore You.